ZAP is the Grand Canyon of wine tastings. There's no way to experience everything, and you're certain to leave overwhelmed (in this case, drunkenly). With 250 wineries pouring nearly 1000 wines for thousands of visitors, you need a strategy. This year, mine was to concentrate on single-vineyard wines from wineries I thought might be good. The flaw in this was that I tasted almost no wines in the affordable $10-$20 range. Single-vineyard Zin goes for $25 and up these days, and those wines aren't selling, so for many consumers this list is completely beside the point. Why did I do it? Hedonism. I wanted to taste the best Zins from the best places from the best producers. Why not? It's my tongue, not yours. I skipped wineries I haven't liked previously (sorry). I didn't bother with "brand" wines -- wines with cute names made from grapes from all over the place. I mostly avoided corporate wines, though I'll say again that Ravenswood's single-vineyard Zins are, as a group, still as good and as interesting as anyone's in California. I tasted a LOT more wines than the ones listed below, but in order to keep moving, if I didn't think a wine was worth 90 points I didn't spend any time on it. * 2007 was a very good year for California Zinfandel. Dry Creek Valley in particular had an excellent '07; I didn't realize this until I looked though the list of wines I liked best. * I'm still not a big fan of Sierra Foothills Zins or Lodi Zins, not in this league anyway. Napa Zins are a good bet. * Balance is coming back into vogue, at least at the high end. Just last year I wrote "hot and sweet" in my notebook a lot, even in this price range. Not this year. * However, spiciness is still an exception, which is a shame because that's a taste characteristic I like in Zins. Most winemakers seem to be going for all fruit and shying away from pepperiness. * That said, I have to stipulate that I'm not the average Zin drinker. 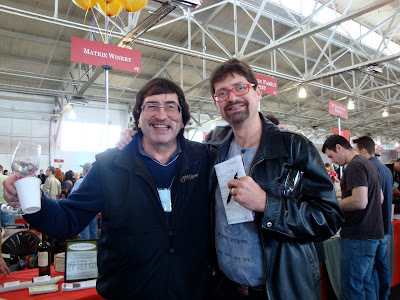 Matt Cline told me on Friday that he once took a stuck-fermentation wine to ZAP to demonstrate what could go wrong with Zinfandel, but because the flawed wine was sweet, everybody loved it. I was thinking of that at one booth where I grimaced at an unpleasantly hot and sweet wine and a woman next to me said, "This is my favorite wine so far!" So if you like your wines big and sweet, you're wasting your time reading my notes. I like the approach here. Skip everything you've tried and don't like and go for a category you're curious about. I'd be lying if I said I haven't avoided ZAP for a bit now due to the crowds, but your post reminded it can be a lot of fun with the right frame of mind and a touch of sarcasm close at hand.